Set within the lovely surroundings of Rock Park in the historic market town of Barnstaple, the regional centre of North Devon, adjacent to the Taw Estuary and a few minutes walk from the town centre. Rock Park Bowling Club is affiliated to the Bowls Devon Association and was established in 1935. Rock Park Bowling Club is a friendly club with a spacious club house and a well stocked bar. 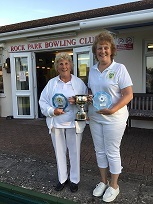 The Club hosts several touring teams throughout the summer season and organises local club friendly matches and club competitions, it also organises several social events throughout the year. The club can provide up to seven rinks and has wheelchair access. Coach parking available. The popular annual open tournament which has been running for over twenty five years continues to be well attended. As from the 8th April 2017 Rock Park Bowling Club has introduced a Smoking Policy. Next years Open Tournament starts on Sunday 1st September 2019 concluding with the finals on Saturday 7th September 2019. Closing date for entries 4th August 2018. We look forward to seeing you all, old friends and new. If you would like to try your hand at bowling just turn up on the day and enjoy having a go at bowls in this friendly and welcoming club. Cheltenham - Fri 17th, Sat 18th and Sun 19th May 2019. Many thanks goes out to our Sponsors, the Tournament Committee, Kitchen Staff, Bar Staff and especially the Groundstaff for making the green an enjoyable surface to play on. Congratulations to the winners:Cynthia Hobbs and Pam Sydenham. Rock Park B C AGM 2019 - Date and time to be advised. Nominations for Officers and Committee Members form will be displayed on the Notice board prior to that date.